The first big free agent re-signing with his own team is just the beginning of the frenzy that's to come around the NHL. Defenceman John Carlson signed a $64 million US, eight-year deal with the Stanley Cup-champion Washington Capitals. The first big free agent re-signing with his own team is just the beginning of the frenzy that's to come around the NHL. Defenceman John Carlson signed a $64 million US, eight-year deal with the Stanley Cup-champion Washington Capitals. His agent and the representatives for other pending unrestricted free agents were able to start talking to any interested teams on Sunday at the beginning of the negotiating window that precedes the opening of the market July 1. 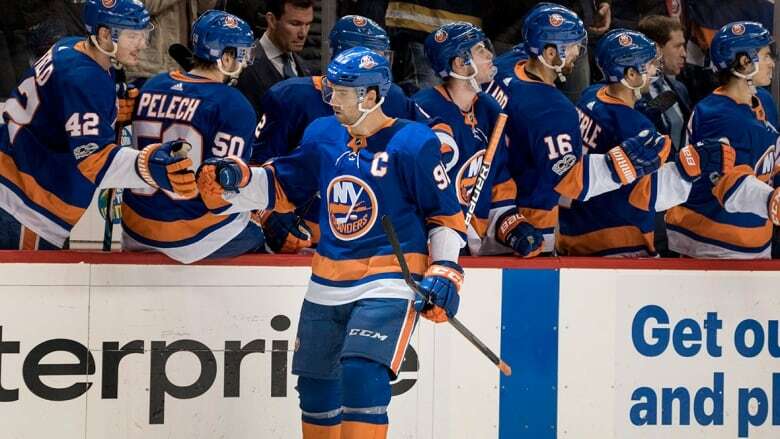 Serious talks between New York Islanders centre John Tavares and five suitors begin Monday in what should be the next step in shaking out signings and trades. The Toronto Maple Leafs were one of the teams to meet with Tavares at his agent Pat Brisson's offices in Los Angeles. Leafs management is now leaving the CAA offices and their meeting with the Tavares camp. A two-hour session, all said. "There's going to be a lot happening," Chicago Blackhawks general manager Stan Bowman said Saturday in Dallas. "Things have sort of been at a standstill around the league, but I think with the free agent market being opened up to be able to have discussions with the agents, that will help, as well. Once you talk, you have an idea that you're going to be able to get a free agent or if you won't, then it might sort of move some teams to start looking at potential trades." Only a handful of current NHL players were traded over the weekend at the draft: four in a swap between Carolina and Calgary and Washington sending two to Colorado to clear salary-cap space to re-sign Carlson. Montreal could still try to trade captain Max Pacioretty this week, and Hurricanes GM Don Waddell wants to make a move for a goaltender and said there's a lot of interest in winger Jeff Skinner. "We have a lot of other possibilities, pieces to move around," Waddell said. With Tavares headlining this free agent class, the possibilities are endless. His decision — reportedly among the Sharks, Maple Leafs, Stars, incumbent Islanders and perhaps one other team — could set up the rest of the market. Paul Stastny is the next-best free agent centre available followed by the likes of Tyler Bozak, Derek Ryan and Tomas Plekanec, and teams that don't land one of them could turn to Buffalo's Ryan O'Reilly, who may be a better candidate to be traded July 2 after the Sabres pay him a $7.5 million bonus. At $8 million a year, Carlson ties Brent Burns for the second-highest cap hit in the league among defenceman behind only P.K. Subban's $9 million with Nashville. Agent Rick Curran fielded calls from other teams Sunday before the deal got done with the Capitals. "Whatever your intentions are, you still have to do your due diligence because there's more to it for me than that," Carlson said Monday in Arlington, Virginia. "I was hoping we could get something done and it worked itself out." The Sharks are worth watching this week after they shed Mikkel Boedker's $4 million salary to clear cap space and watched as Ilya Kovalchuk signed with Los Angeles on a three-year, $18.75 million deal. After saying San Jose will spend much of its space to re-sign players, GM Doug Wilson acknowledged there will still be plenty of room to add the difference-maker he's looking for. Asked if he thinks he'll be able to land that difference-maker by the afternoon of July 1, Wilson smirked and said: "The fifth is my birthday. Ask me then." By July 5, most of the hockey community will be preparing for vacation. The real fun comes over the next week. Toronto's James van Riemsdyk, Vegas' James Neal and David Perron, Boston's Rick Nash, Columbus' Thomas Vanek and New Jersey's Patrick Maroon are among the wingers available. Carlson staying with Washington leaves Detroit's Mike Green, Dallas' Dan Hamhuis and Columbus' Ian Cole at the top of the list of defencemen available. "There are some free agents out there that we like," said Rangers GM Jeff Gorton, whose team shifted toward a rebuild this past season. "We're in a pretty good spot to talk to as many free agents that we can that we like and we'll go forward that way." Unlike New York, which had been in win-now mode for a while, the expansion Golden Knights were supposed to be building slowly toward becoming a perennial playoff contender. After reaching the Cup final in their first season, they could use an overflowing amount of cap space this off-season — though GM George McPhee doesn't want to overpromise and under-deliver. "You just never know with these things and whether we'll do anything at all or do something," McPhee said. "You're sort of venturing into an area where there's all kinds of things going on and you don't know how it's going to go. There's no urgency for us to do anything. We like the team we have, we like the model we have. If we can make it better by doing something that makes sense, then we'll do it."